At first it feels like gripping the textured plastic holds, twenty or thirty feet up in the air secured by a rope and a harness; unable to go any farther, readying to let go. That scary second of swinging free but no doubt that the rope will hold and you will be slowly let down until you touch the ground again. It’s a feeling of jumping into the unknown when you really have nothing to lose. I can’t remember a time when I didn’t take as many liberties with a recipe as I needed but recently I have felt myself forging even farther ahead without holding on to a guideline to keep me safe. The salad below is an example of something I threw together without hesitation or concern about the results. 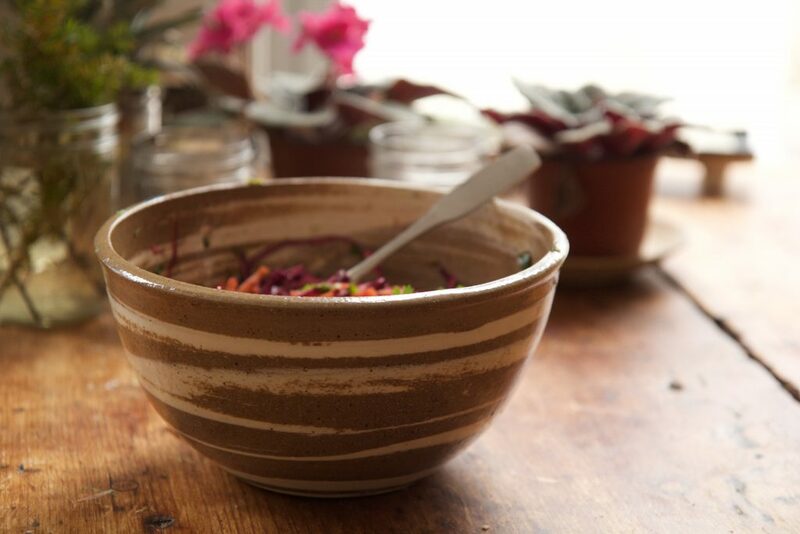 I was delighted enough to make it again a few days later and to want to share it here because the combination of crunchy vegetables, bold colors and tangy lime juice is a lovely antidote to the grey, mud, and dirty snow that surrounds us in these early days of spring. But I’ve been feeling more than just improvisational moments in the kitchen. It is a letting go, uncertain of what will happen but knowing that I won’t come crashing down. I don’t know if it is mastery or foolishness, it feels a little wobbly and a bit rebellious but it comes down to trusting myself, at least when I am standing at the kitchen counter. Not sure how to make miso ginger dressing and no recipe seems quite right? A little of this and a bit of that shaken in a jar. A whim to make braided rolls but no bread cookbooks offer what I am looking for? Just go for it. This feeling of freedom and confidence in the kitchen is, perhaps, at odds with the uncertainty and challenges in so many aspects of life. But I feel bits of it leaking in here and there, beyond mixing bowls and sauté pans, a sense of freedom and acceptance in the rest of life. I am more concerned about the results than I am when I make a salad but sometimes I can trust myself. I’m providing a recipe, though I encourage you to let go a bit and find creative freedom wherever you can. 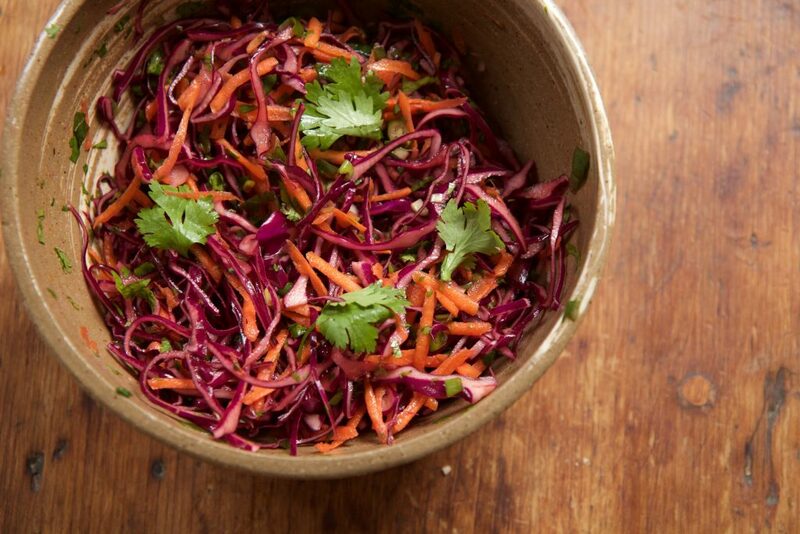 This colorful crunchy slaw is great on its own but we’ve been eating it with black beans and crepes or tortillas and whatever else you like on top. I use bottled lime juice because it is an easy way to have lime on hand but freshly squeezed lime would be great and you can adjust the amount you would like to your taste. Cut of the root ends of the scallions and thinly slice all the way to the end of the greens. Chop the sliced scallions into smaller pieces. 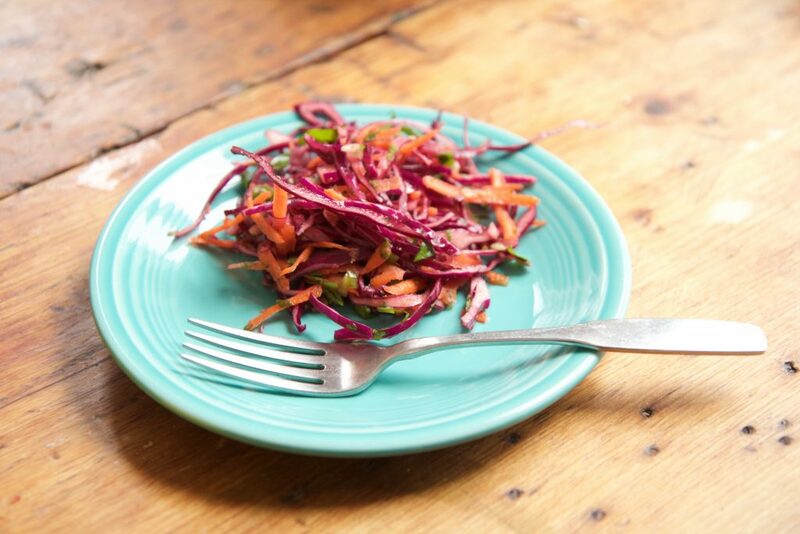 Combine the chopped scallion with grated carrot, shredded cabbage, chopped cilantro, lime juice, olive oil and salt. Toss a few times until everything is mixed together.